Having only recently joined the site I've noticed a lot of forum requests for decent beginners books for Java! Now, I've been trying to get my head around Java for a few years now (please note that I'm an electronics technician, not a programmer) and I've tried a whole plethora of books in my attempts to get a handle on Java. All to no avail! I don't know what it is about all the books I read before that I could quite get a hold of, but somehow, at some point I found myself getting bogged down in some area which didn't seem to make sense to me! 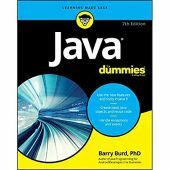 In the last two weeks I've been reading Doug Lowe's Java All-in-one for Dummies 4th Edition!There is a 5th edition available now, but the 4th is still highly relevant. So far I haven't come across anything which is outdated! Best of all, for some reason, EVERY THING IS FINALLY MAKING SENSE! 😁. I don't know if this is down to the many abortive attempts to learn and somehow it's now making sense, but I think the book deserves the credit! Every subject is approached excellently in a step by step manner in plain English. No terse or vague explanations that leave you no better informed than before you read it and none of the superfluous verbosity which leaves the reader wondering if he needs to re-learn English first! I bought my copy from Google Play Books (sub £20), where I purchase most of my books these days. However, you can find it in just about any decent book store online or in the real world. For those who are taking their first steps into Java or into programming as a whole, this would be a fantastic book to begin with. However, one thing I learned about learning when I was at college is that no single educational book will ever make 100% sense! Its to the students advantage to purchase around 3 books for each subject! That way, if one book explains an aspect of the subject in an obtuse manner, with luck, one of the other two will help lift the fog! All the above said, I'd recommend this book as an essential purchase for anyone just beginning to program in Java for the first time. Even if you're an experienced programmer in another language moving into Java.